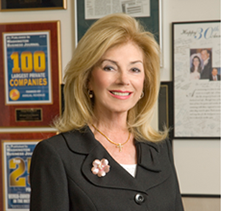 President and CEO – Gloria Bohan launched Omega World Travel in 1972 as a small-town storefront travel agency. Today, Omega is the top woman-owned business in the U.S.
Gloria is a very hands-on owner, focusing on strategic partnerships and long term direction of the organization. Gloria is a graduate of Marymount Manhattan College, where she also serves as a trustee and holds an honorary doctorate.